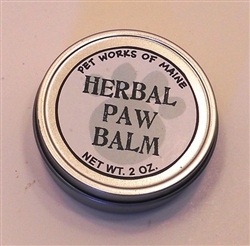 Our Paw Balm is a soothing all natural balm that conditions and protects your pet's paw pads. The pads of paws can become dry, thickened and cracked. Help add moisture and softness with our conditioning balm. The natural ingredients (made with an herbal infusion and pure essential oils) of our Paw Balm conditions and protects your dog's pads, helping them become more pliable while reducing the risk of injury against rough rocky roads, hot tar surfaces, ice, salt or steaming concrete. Our paw balm also aids against slippage allowing your dog greater mobility. You can also use the balm on your dog's nose, if it's dry & flaky (or "crusty"). Directions: Smooth a small amount of ointment into the pads of paws. Do not use on cuts, blisters or if pads are torn. Contains: Prunus Amygdalus Dulcis (Sweet Almond) Oil, Olea Europaea (Olive) Fruit Oil, Butyrospermum Parkii (Shea Butter) Fruit, Beeswax, Simmondsia Chinensis (Jojoba) Seed Oil, Extract of: Calendula Officinalis (Calendula) Flower, Matricaria Recutita (Chamomile) Flower, Plantain; Lavandula Officinalis (Lavender) Oil, Rosmarinus Officinalis (Rosemary) Oil, Ocimum Basilicum (Basil) Oil, Tocopherol. Packaged in a 2 oz. Tin (also available in a 1/2 oz. screwtop tin). Store at room temperature.